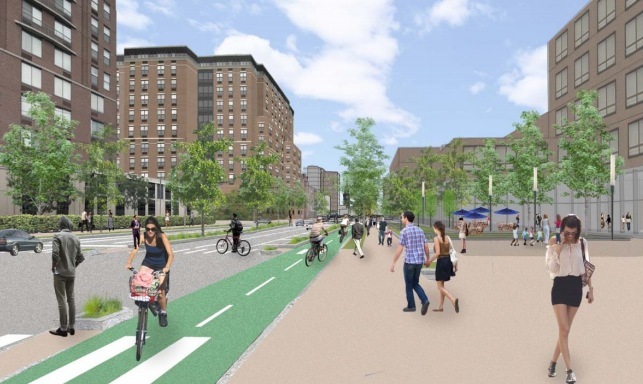 By the end of this year, it’s going to be very, very easy to bike around Hoboken. 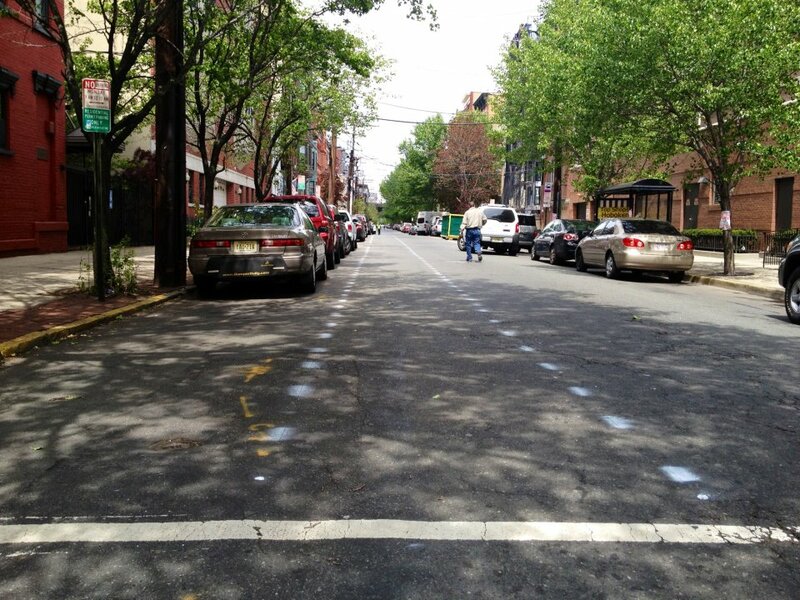 Thanks to an ordinance unanimously approved by the Hoboken City Council last year, the city is now at work implementing ten miles of new bike lanes. That number might seem small, until you realize that Hoboken only has 32 miles of streets in total. Throw in the almost two and a half miles of existing bike lanes in the Mile Square City, and just about 40 percent the streets in town will have bike lanes. Include sharrows and approximately 80 percent of the streets in Hoboken will have some kind of cycling designation. The marquee bike project, though, is the city’s ongoing redesign of Observer Highway, where a federally funded project will add a 0.34 mile two-way protected bike lane (also known as a cycle track), among other changes. The city wants to rechristen the road, which runs right to Hoboken’s multi-modal transit hub, as “Observer Boulevard.” That project could be completed this year, though if federal approvals lag it will be pushed into 2013, according to city spokesperson Juan Melli. Most of the cycle tracks built in the United States have been located in large cities — New York City’s protected Ninth Avenue lane helped prove the viability of the treatment — but Hoboken’s plans are part of a new trend as protected lanes start to pop up in smaller cities and towns. Evanston, Illinois is building a cycle track this summer to provide a safe connection to its waterfront path. On top of the new bike lanes, Hoboken hopes to launch a joint bike-share system this summer, said Melli. The program would be run in conjunction with the Hudson County Transportation Management Association, so that the system can expand into Jersey City, which is also interested in bike-share, and then to other neighboring towns. An RFP is expected this spring. This impressive commitment to the city’s bike infrastructure is just a part of Hoboken’s larger investment in sustainable transportation. Under Mayor Dawn Zimmer and Transportation Director Ian Sacs, Hoboken has also planned a slew of pedestrian safety improvements, created space for car-sharing across the city, offered a basket of incentives for residents who give up their vehicles, urged drivers to stick below 20 miles per hour and revitalized its shuttle bus service. It’s too bad that you can’t take any full-frame bike to or from Hoboken (or, for example, to most of the Shore stops) on NJ transit anymore, not at any time. This is a major step backwards, I need hardly tell this audience. Please cover this and help apply pressure! This is a fascinating experiment, and I can’t wait to see how it turns out. I must say I’m a little bit skeptical, as the logic behind it seems a bit simplistic: Bike lanes are good, therefore let’s put bike lanes on every street. This approach, however, fails to deal with the inherent problems with bike lanes, including double parking, cars swerving into the lanes, speeding, and a limited sense of safety, which in turn, limits the number of new riders induced to try biking because of the striped bike lanes. It seems to me that a more nuanced approach might be to focus on a few key corridors and bring a high standard (8-80) of bike facilities to those corridors, by addressing cyclist sense of safety, speeding, and double parking issues. This approach might cost a bit more in terms of time, political capital, and money, but it would likely induce far more people to try biking. All that said, this is an incredible feat for a city. It will almost certainly be the only city in the nation to have 1/3 of all streets with some sort of bike facility. It will put biking front and center in the city’s consciousness, since you simply won’t be able to miss the bike lanes. Hopefully, I’ll be proven wrong and the lanes will be full of cyclists. The streets are pretty narrow to begin with, so the effect of adding bike lanes will be quite different from when bike lanes are added to 6 lane arterials. In addition, the cycle track idea certainly meets the 8-80 requirement, and sounds like a real game-changer to me. Good luck, Hoboken! Excellent! Now all we need is that pedestrian/bicycle bridge to connect Manhattan with Hoboken and the two cities will truly be linked. I wouldn’t mind paying a toll either as long as I don’t have to take the PATH or pay $10.25 (one way) for the ferry. The anti-everything crowd in Hoboken will complain about this, but I can’t wait for it to happen. Visetti Way is currently a severely underutilized piece of real estate, unless you count parking cars as a good use of the land (A parking garage could do that and not take up 8 blocks). The next step is continuing the bike protected bike lane along Sinatra Street uptown further. Kudos to Hoboken for their initiative. They should definitely focus on fine-tuning the real trouble areas and put facilities where necessary; certainly not every street needs one, unless every street in Hoboken is an arterial, which I doubt. A successful network needs to have true connectivity. My city of Tallahassee won a Bronze award from the LAB some years ago, on the basis that it has over 100 miles of bike lanes. Sound great right? Not when you look at the map and realize that only 4 streets in the downtown area have bike lanes on only a FEW BLOCKS. And one of them (College Ave) is 24/7 parking for the sorority and fraternity members and just a complete insult and joke. Many are hardly ever swept and always full of debris and very narrow. The city claims they are mostly 4-feet, but they must be including the gutter, which they shouldn’t be doing. There’s also no connectivity whatsoever. Hoboken has worked a hard uphill battle to give “legs” to this bike lane initiative, however, as noted earlier, in Hoboken in particular, double parked cars are a huge issue. If we can lick that, this will really be a great, ecologically awesome modernization of Hoboken! SlipNOT perforated metal is ideal for cycle safe lanes that are originally made of bar grating. SlipNOT perforated plate provides a slip resistant surface and allows light and air to filter through.